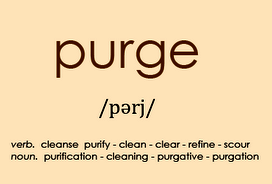 About twice a year my husband and I do an "analyze and purge" drill in our home. We get rid of the stuff that our kids have outgrown and replace it with new stuff we imagine they're ready for. Out with the high chairs, in with the booster seats! Out with the walkers, in with the train sets! I rushed home with my purchase in hand and called out for the children to gather round! We were about to embark on a new era of merriment and it was beginning RIGHT NOW!!! My two boys hustled to the table full of wonder and inquiry. they inquired as they glimpsed the bright red whimsical face on the box. "It's an awesome new game we're all going to play together!" My mother-in-law joined us at the table and I asked her to read the instructions aloud. She let me know that I should give each player an equal number of beans. 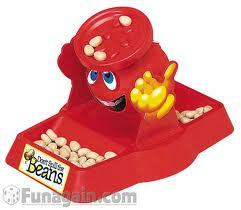 Then players would take turns, each placing one bean on the lid of the jar. When someone's bean tipped the jar, that person would take possession of the fallen beans and the game would continue until one player -- the triumphant winner -- was completely out of beans. It all seemed simple enough. STEP ONE: Distribute an equal number of beans to each player. I put one bean in front of each of my boys. They immediately responded by attempting to steal each other's beans. "NO! NO! Wait! You'll both get plenty of beans!!! 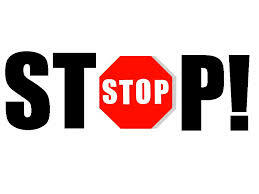 Hold on." Each bean I doled out started a new round of trouble. There was unapproved placing of beans on the lid. There was a lot of bean throwing. This resulted in a dangerous case of attempted bean ingestion by their little sister, playing on the floor below the table. STEP TWO: Each player takes a turn placing one bean on top of the lid. I thought perhaps that some good modeling might help with this step, so I asked my mother-in-law to start by gently placing one bean atop the lid. At which point I calmly added another bean. Then my two-year-old dumped six beans on top. Then my four-year-old added sixteen beans all at once and beans went flying everywhere. "WE SPILLED THEM! 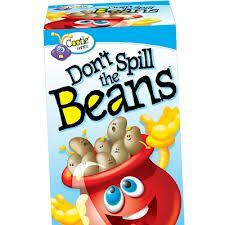 WE SPILLED THE BEANS!!!!!!!!" The game did not improve from there. The boys continued to fling beans wildly at the lid, howling with laughter each time the jar tipped over. My mother-in-law and I tried valiantly to steer the game back to, you know, anything that actually involved any version of the rules, but it was not to be. Realizing we'd been overrun, we gave up and left them to their super-fun game of "SPILL AS MANY BEANS AS HUMANLY POSSIBLE AND IN EVERY DIRECTION, PLEASE." At some point they tired themselves out. I packed up the few beans that had survived their onslaught, put the game up on a high shelf, and realized that my dream of merry family fun times may still be a ways off in the distance. Or who knows? Maybe my plan to introduce the kids to "DON'T BREAK THE ICE" will prove the solution to all my problems!!!!! 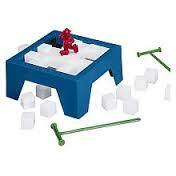 Children, multiple pieces, hammers -- WHAT COULD POSSIBLY GO WRONG?